ST. PETERSBURG, Fla. (AP) There’s an upswing in monkey business in and around a state park in Florida, where bands of non-native rhesus macaques live along a river that’s popular with kayakers and tourists. Officials have closed two walking areas at Silver Springs State Park because of unwanted monkey interactions with park guests. An observation deck and a boardwalk are off-limits because the primates have essentially taken over. Matt Mitchell, the assistant director of Florida State Parks, said rangers are checking areas each morning for monkey activity. Researchers estimate anywhere from 150 to 200 wild rhesus macaques live at the park and an unknown number live outside. A video shot by an Estero family showing seemingly aggressive monkeys on one of the park’s boardwalks made the rounds recently on social media. Park rangers try to warn visitors not to feed the 20-pound, 2-foot tall mammals and are stepping up patrols in sections where there are high possibilities of monkey-human interaction. The monkeys were introduced to the area in the 1930s by a tour boat operator named Colonel Tooey. He thought it would be a good idea to release six macaques on a small island in the Silver River and call it Monkey Island to draw tourists. Many generations of monkeying around ensued, aided by the relative lack of natural predators (other than alligators, which often eat young, naïve primates on the riverbanks). The monkeys thrived in the warm climate and the park at one time sold “monkey chow” so visitors could feed the primates. At one time in the 1980s, there were 400 of the animals in the park, prompting state officials to try to wrest control of the situation. Some of the females were sterilized. Previous attempts to cull the group drew strong opposition from locals – especially when some captured primates were sold to research labs. “At least from a cultural perspective, the people who live in Ocala very much value their presence in the community,” Kirksey said. But once again, state officials are considering options to control the primates – after all, viral videos of charging monkeys aren’t the best publicity for the park. Mitchell said the Florida Fish and Wildlife Conservation Commission has been notified and is monitoring the monkeys. There have been 18 confirmed reports of bites and scratches from the animals since they arrived at the park. Experts say monkeys can carry and transmit Herpes B-virus, but there’s no evidence that anyone has gotten sick from the Silver Springs monkeys. “You definitely don’t want to get near them. You don’t want to antagonize them,” said Steve Johnson, an associate professor of wildlife ecology at University of Florida who researches the monkeys. Johnson said there are four or five groups of monkeys in the park, and other groups are outside the park. 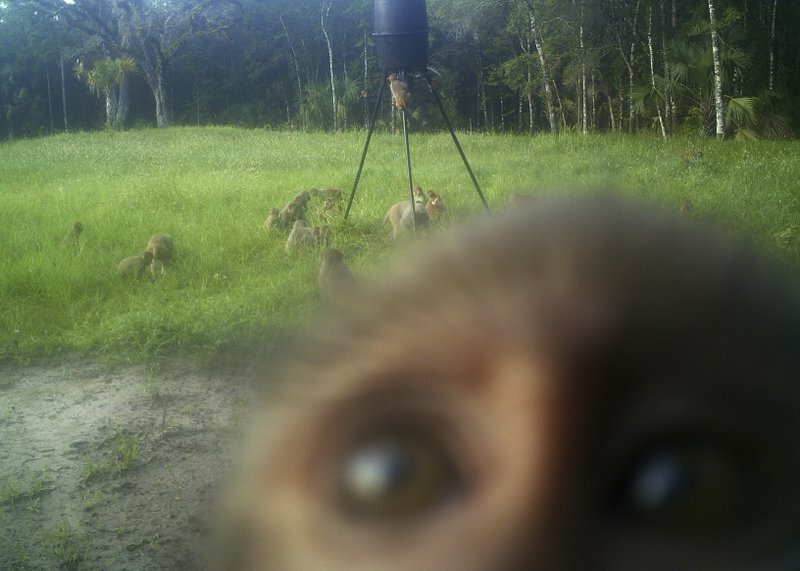 Recently, a homeowner 4 miles away captured photos of some 50 monkeys swarming his deer feeder. Brian Pritchard’s automatic camera, anchored to a tree, was even inspected by one monkey, whose face practically fills a frame as others cavort in the background.